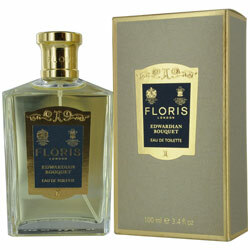 You will adore the way Floris Edwardian Bouquet takes you back to a time of lavishness and refinement. Introduced in 1901, this timeless casual women's perfume features a sophisticated blend of jasmine, rose, ylang-ylang, patchouli, sandalwood, and moss to create a rich green fragrance. The superb combination of fresh floral and woody aromas will make you feel both elegant and vibrant, and you will fall in love with the soft powdery scent of this immaculate perfume.